It was Saturday evening and Homecoming Weekend for Williams College, putting Spice Root at near capacity. From the moment we entered the front door, until the time we left, our experience was one of excellence. In fact, we have dined at Spice Root numerous times over the past 5+ years and each time has been a pleasure. We have gone as a couple ...as part of a group ...with those that dine at Indian restaurants often ...and with "rookies" that have never experienced the amazing flavors of India. In fact, if Indian food is a new experience for you, or someone in your party ...not to worry, the staff at Spice Root is excellent in asking the right questions and making suggestions. The menu is well represented with traditional, vegan and vegetarian dishes. On this night, as a party of three, we decided to order a variety of dishes, allowing us to sample the various flavors and spices the Indian cuisine is so well known for. For starters we ordered the Crab Cakes, Chicken Lollipop (Indo-Chinese) and Nan Bread (garlic and cilantro). The crab cakes (two) were seasoned and cooked perfectly and accompanied by a delicious chutney sauce. There were 5 large chicken lollipops (drum sticks), battered and deep fried to perfection, finished with a spicy sauce and served with two delicious side sauces. This dish is a "must try" along with the garlic and cilantro Nan bread. FYI, if you have a bread lover in your party, I'd suggest a second order, as the Nan bread will go quickly ...I promise! For our main entrées ...we choose Chicken Tikki Masala, Szechwan Chicken (Indo-Chinese) and Tandoori Medley, all served with rice. First, let me say that I have had Chicken Tikkii Masala numerous times and it is one of my favorites. The boneless chicken was tender and served in a carefully seasoned, creamy, tomato sauce. This dish has always been a big hit with those we have recommended it to and suggest it as a great introduction to Indian cuisine, as it is mild, yet flavorful. If you like things a bit more on the spicy side, then the Szechwan Chicken is perfect. Although everyone is not a fan of spicy food, this dish does have a mild heat, but is loaded with flavor. Once again the chicken was tender and the sauce full of flavor ...an outstanding dish. The third entrée we ordered was the Tandoori Medley, which is a mélange of lamb, shrimp and chicken and one of their fabulous "Signature" dishes. The lamb had an amazing flavor, as did the shrimp. There is boneless as well as bone on chicken, both gently seasoned and cooked just right. 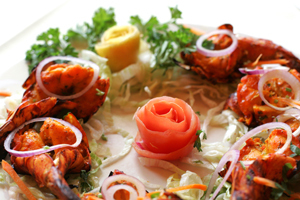 If you have a big appetite, the Tandoori Medley should do the trick. What would dinner at Spice Root be without dessert? With that being said, we couldn't resist the Kheer, which is a saffron rice pudding with nuts and raisins and Mango Kulfi (recommended by the manager), a creamy ice cream made with pulp of imported Alfonzo mangoes. Now, I will admit that there is a lot to be said for rice pudding ...as good rice pudding is not always easy to find. If you have even the slightest liking for rice pudding then I urge you to try the Kheer. The Mango Kulfi is amazing. Just one problem ...it leaves you wanting more ...it is that good!